Our product range offered by us consists of Silicone Coated Fiberglass Products, Silica Fiber Products and Ceramic Fiber Products. These high temperature insulation products are known for their rich attributes such as excellent insulating property, sturdy construction and longer serving life. 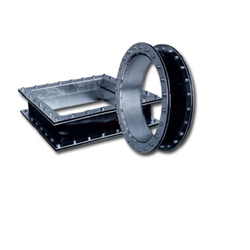 As per the specifications provided by the customers, these insulation products can be customers. Smart–Shield manufacturers Extremely Flexible Pyro-Textiles Products can withstand repeated exposures to molten steel, molten aluminum and molten glass up to 3000°F (1650°C). These specially designed compound sheds molten metal splash immediately, so very little heat transfer occurs. 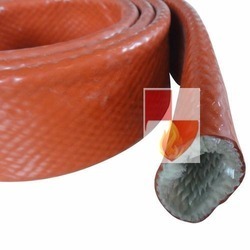 These products are made from incombustible E-type Fiber glass yarns and are covered in a thick layer of red silicone rubber which provides a high level of heat and fire insulation. When exposed to flame, the silicone rubber transforms into a crust, creating a protective SiO2 refractory layer thus providing effective protection against burns from hot hoses and flexible steamlines, while reducing heat energy losses. Other Names : Fire Resistant Products, Fire Retardant Products, Flame Resistant Products, Fire Tape, Fire Sleeve, Fire Blanket, Welding Curtain. Variants : Cloth, Tapes with Adhesive Backing, Sleeves, Blanket. Supporting continuous operating temperatures of 2300°F (1260°C) with peak temperatures to 3000°F (1650°C), extremely flexible 96% Pure Silica Fiber Products will resist molten metal splashing, welding splatter, direct flame impact and are resistant to thermal shock. Besides these excellent qualities, Silica Fiber Products are highly resistant to corrosion and deterioration caused by chemicals, have good electrical insulation capabilities and remain flexible and drapable at high temperatures. Silica Fiber Products are highly used in the iron metallurgy industry, industrial furnaces, electric ovens, boilers, stoves, chimneys, gaskets, sealing joints, industrial insulation, various uses at high temperatures insulation, refractory paddings, gaskets and blankets, protection from flame, splashes of molten metal, excessive heat, compensators. Smart- Shield Flexible Graphite Products are produced from pure, expanded flexible graphite and do not contain any other fibers or filler materials. 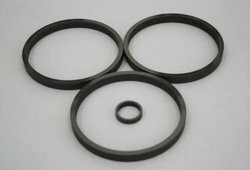 Because of their specific structure expanded graphite Products are particularly suited for applications with extremely high or low temperatures, with highly corrosive and aggressive media, for sensitive flange materials (i.e. ceramic, glass, plastic) and for gas as well as steam applications. Smart-Shield offers an extensive range of gland packing, designed and constructed to minimize maintenance costs whilst maintaining production efficiencies from the whole selection available, using the most advanced packing fibers, the highest quality braiding methods and the best lubrication processes. Our philosophy is to offer the most suitable packing for each application, from the wide selection available, using the most advanced packing fibers, the highest quality braiding methods and the best lubrication process and to offer an ex-stock service in premium quality, square braided packing at market leading prices. All packing are square-braided on the most advanced specification braiding machines available. Twenty four and thirty six track braiders are utilized to produce four-ply, square inter-braid packing on all sizes from 6mm upwards. Fibers are run from the core of the packing section to the corner-posts and surfaces, whilst being cross-locked in a square, lattice construction, to produce maximum resilience and a highly dense, square packing, to minimize wear and product loss, whilst increasing packing reliability and life. Variants : Cloth, Tapes, Ropes, Sleeves, Blanket. Smart- Shield’s Ceramic Fiber Products are non-combustible when tested in accordance with BS 476, Part 4 are made from alumina-silica ceramic fiber, free of asbestos. These fiber materials can be used in different industrial applications under temperatures up to 1300°C and have excellent chemical stability and strong resistance to thermal shock and corrosion attack. Inconel wire / SS wire and fiberglass filament are incorporated into the yarn to increase tensile strength of the fabrics both before and after exposure to heat. Typical applications for tapes include gaskets, seals, furnace and welding curtains or pipe wrapping. Hydraulic cylinders face contaminants ranging, the Smart Shield’s cylinder cover protects your constantly exposed hydraulic equipment from damage caused from dust, abrasive grit to metal chips and weld spatter entering the hydraulic system. This easy to install protective cover opens and closes like an accordion as the cylinders work, keeping the hydraulic system clean from debris and extending the life of your cylinders up to 3 times. The main advantages of our covers in your machinery include their flexibility (they are made to your own individual requirements in order to fit your mechanisms perfectly) and their cost-effectiveness. 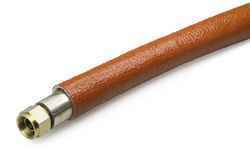 A variety of designs are available in any quantity with little or no tooling charge. This lets you optimize the type of protection for your application, rather than making do with off-the-shelf components. Available in multiple heat and chemical resistant materials, this protective device is being utilized today in many of the toughest industrial and construction environments including, quarries, mining, steel mills, demolition, and ready mix concrete facilities This smart-shield’s Protector is reducing hydraulics maintenance costs and saving money for companies throughout the world. 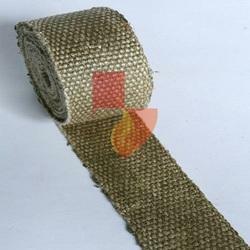 Smart Shield manufactures Welding / Fire Blanket using heat and flame resistant fabrics. 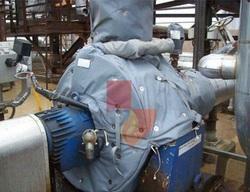 The blankets provide excellent protection from grinding / welding sparks, slag and drops of molten metal. We manufacture a wide range of blankets which are non-combustible and classified as per the temperature requirements in many different sizes. 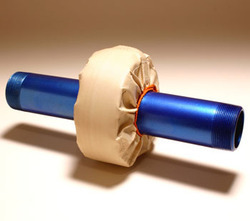 Flexibility – The weight of the blanket indicates how flexible the fabric is, a blanket of less weight makes it easier to protect small pipes and components where it’s necessary to wrap the blanket. 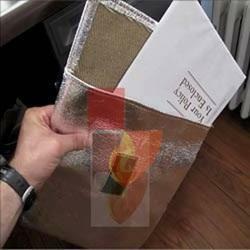 Positioning of the blanket – Sparks hitting a blanket, which is positioned horizontally, will put extra stress on the material and a stronger and more heat resistant blanket should be used. 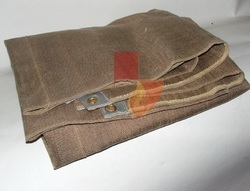 For light duty welding or cutting a thinner and less heat resistant blanket can be used. For heavy duty welding or cutting when the blanket is exposed to drops of molten metal then a more durable blanket should be used. Variants : Cloth, Ropes, Tapes, Sleeves, Blanket. Non itchy Fiberglass Products braided from texturized E-glass fiber yarn are designed as a replacement for Asbestos / Ceramic Fabric has no known hazard towards environments. Designed to expand and contract, these extremely flexible Fiber glass products (E-type) can withstand continuous exposure of 1200°F / 650°C, has low thermal conductivity coefficient and are completely non-combustible. 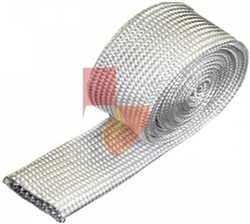 They are widely used as Heat Insulation Pads on Pipe wrap and can also be used for industrial ovens, furnaces, boilers and wood burning stoves, crucible packing and pollution control equipment; high temperature tying and lacing cords; and tadpole tape / gasket core ropes. The basic fiber is manufactured in accordance with specifications outlined in ASTM D-578, ASTM committee D13, and subcommittee D13 1B. Smart Shield’s Fire Resistant bags Ideal for Protecting. Passports. Wills. And much more…. Smart Shield’s Fire proof Document Bags provides protection to items of great personal importance such as heirlooms and vital documents that we wish to protect from the devastating effects of fire. Smart Shield’s Fire Resistant bags can be stored almost anywhere providing a quick and easy way to organize, protect and prolong the life of your most personal belongings and precious memories. The base fabric will support continuous operating temperatures of 2300°F (1260°C) with peak temperatures to 3000°F (1650°C). The Aluminized Coating will reflect up to 95% of heat, with no organic flame contribution and provides a tough, impermeable, heat reflective coating, Although the aluminum coating is considered to be sacrificial at temperatures above 600°C the clever design forms a tight seal – minimizing the chances of fire ever reaching the contents. 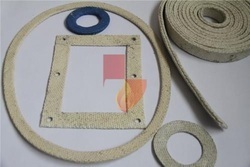 Non itchy Tetraglass Gaskets are braided by texturized Tetraglass fiber yarn is designed as a replacement for Asbestos / Ceramic Tapes has no known hazard towards environments. Designed to expand and contract, these extremely flexible Tetraglass Gaskets can withstand continuous exposure of 1200°F / 650°C, has low thermal conductivity coefficient and are completely non-combustible. They are widely used as Heat Insulation Pads on Pipe wrap and can also be used for industrial ovens, furnaces, boilers and wood burning stoves, crucible packing and pollution control equipment; high temperature tying and lacing cords; and tadpole tape / gasket core ropes. Applications include boiler, coke oven, industrial oven, and wood stove doors; crucible packing and pollution control equipment; high temperature tying and lacing cords; and tadpole tape / gasket core ropes. Smart-Shield’s Exhaust Wraps especially developed for the headers and exhaust where protection against heat is necessary. These wraps are either made from Ceramic, Fiberglass or Silica Fibers (depending on the temperature) and reduces radiant exhaust heat, keeping the incoming air/fuel mixture cool and potent. These fiber materials can be used in different applications under temperatures up to 1300°C and have excellent chemical stability and strong resistance to thermal shock and corrosion attack. Our Exhaust Wrap reduces under-hood temp. up to 70%, increases horsepower and fuel efficiency. Wrap works by holding heat within the header, which creates a better exhaust flow. This allows easy removal of spent gasses and creates more airflow to the engine. 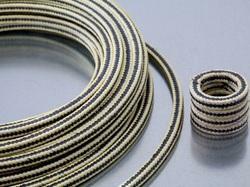 Manufacturer of a wide range of products which include aluminum coated fiberglass tape. 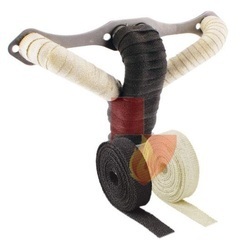 Offering you a complete choice of products which include braided sleeve, fire sleeve, fire sleeve hose, heat insulation sleeve and insulating sleeve. 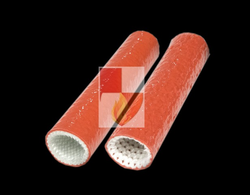 Providing you the best range of pyro sleeve with hook & loop closure with effective & timely delivery. Pioneers in the industry, we offer heat sleeves, insulation tape, pyro jacket, insulation cloth and fabric insulation tape from India.